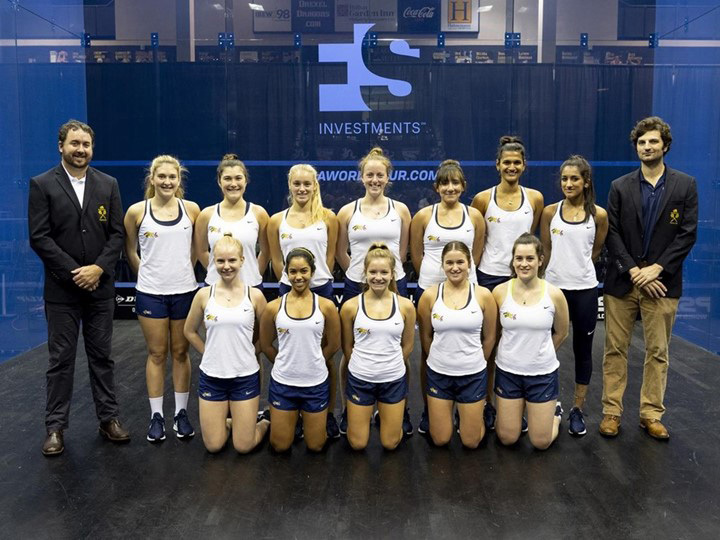 After tough losses against Trinity College Dec. 7, 2018, the Drexel men and women’s squash teams looked to bounce back with a match against Cornell University to kick start the new year Jan. 18. But before this, the men’s team went up against the University of Rochester Jan. 12. Freshman Matias Knudsen adhered to his winning pattern with a victory over Ricardo Lopez, 11-7, 11-9, 11-4. This was the strongest win for the Dragons for the match. Sophomore Dylan Kachur had the other win of the match. This one was not as straightforward as the other, as Kachur’s match went to four games. After winning the first game, he fell in the next. However, he battled back and won the next two and the match, 11-6, 10-12, 14-12, 11-7. The rest of the men’s team did not have as much luck as these two, as only two of them did not lose in straight sets. Freshman Filip Krueger took his match to four games, as he won the first game, but could not win another. Senior Luke Willemse had the toughest loss of the match, as he took his to five games. He lost the first game, but bounced back and won the next two. He took the second game into extra points, which gave him the momentum, but he failed to win a third game and lost the match. The men’s team overall lost to Rochester 7-2. The men and women’s teams then moved on to face Cornell. The men’s team had a little more luck than they did against Rochester. They had very similar results to the Rochester match, as Knudsen won in three games and Kachur in four. However, the difference arose when two more Dragons won against Cornell. Senior Bransten Ming fought hard in his match, as he took it to five games. He won the first, but fell in the next two. He came back and climbed his way out of that deficit to win. Willemse had better luck this match, as he strolled to an easy three-game win. However, these victories were not enough to get a win over Cornell, and the Dragons lost 5-4. The women had the exact opposite outcome with their match against Cornell. Junior Anna Hughes led a strong start to the match by winning in three games against Madison Miles. Sophomore Ona Prokes, who took her match to four games, came away with the win. Senior and team captain Fiona Power played a hard fought match against Lucy Martin. Martin won the third game, which took the match to a fourth, but Power focused and won the match. Sophomore Hannah Blatt played a four-game match and in the end, also won. Freshman Brooke Herring’s was the deciding match, as Drexel and Cornell were tied at 4-4. With yet another four-game match, she came away with the win and the Dragons won, 5-4. This was Drexel’s first win over Cornell in program history. The squash teams will now focus their attention to Senior Day when they host Colby College Jan. 27 at the Kline & Specter Squash Center at 10:30 a.m.